The DIA Group is aware that an improvement in employee satisfaction leads to higher levels of employee commitment towards the company’s projects. This is why employee satisfaction is one of the objectives of the Human Resources Master Plan, and is focused on at all levels, from the most basic (related to needs such as remuneration or equal opportunities) to higher levels related to facilitating better employee performance and ensuring greater employee recognition. In 2017, 89.7% of all of the group’s employment contracts were permanent, while average employee turnover (understood to be voluntary resignations) was 1.01%. 100% of the group’s employees are protected by a collective labour agreement, either at company level (in the case of Spain) or at sector level (in the case of Portugal, Argentina, and Brazil), and the company has 1,113 trade union representatives worldwide (102-41). These data, coupled with an average employee seniority of 8.3 years, represents a good indicator of the quality of labour relations between the DIA Group and its employees. In relation to job creation, average workforce has slightly decreased in relation to 2016 not only due to the reduction of retail surface but also because the running of some stores is been outsourced. The DIA Group is in constant communication with its employees at all levels, allowing it to transfer its corporate identity to the workforce, building confidence and good relations between employees. In addition to the direct contact with employees that the company is promoting through the tools mentioned in this section, every two years the DIA Group conducts a survey involving 100% of its workforce in all the countries in which it operates. This is a voluntary project, which, through a third party, guarantees the total anonymity and privacy of all the answers given by employees. The last survey was conducted in the last quarter of 2016, in which more than 44,000 people took part. The results of this survey allowed the company to identify several improvement areas that are being worked on, at the Group level as well as in each country and in the regional centres. During 2017, the company once again took stock of the mood among headquarter staff due to the new internal organisation by banner, and of the commercial and purchasing areas that are being developed. The aim of this was to determine (through specific surveys conducted through mobile applications) employees’ opinions regarding organisational and structural issues. Information about the Group’s services, structure, policies, products, brands, and media campaigns. Information about the Group’s companies. Offers for employees and social benefits. Free membership spaces for exchanging information. In Argentina, this new portal (which is more dynamic and intuitive) has started to be developed, with a first pilot project at the end of 2017, in which 1,400 employees have already been involved. Brazil and Portugal are still in the preparation phase, and plan to roll it out in 2018. In addition, internal two-way communication has been strengthened with the creation of new two-way communication spaces, sometimes face-to-face, or leveraging the latest technologies, which allow employees to express their questions or concerns to management. Twice a year, the CEO and the entire management team give a presentation about the company’s performance, with questions in an open format through videoconferences with employees in all countries. These informative meetings cover both operational and strategic issues and objectives, which are shared with most of the workforce. In turn, the Group directors have three meetings a year with the Management Committee, in which they analyse the results and share various questions about the business. The webcast with analysts and the presentation of results to the press can be followed by employees on the corporate website (for the webcast) and on Periscope (for the press conference). The DIA Group has an active policy in terms of talent retention and training, which identifies, recognises, and promotes the value that different profiles generate for the organisation. Ongoing training is a priority in a context of constant change and innovation, mainly focused on adapting to new customer needs. Accordingly, the company has placed an ongoing focus on training its workforce. 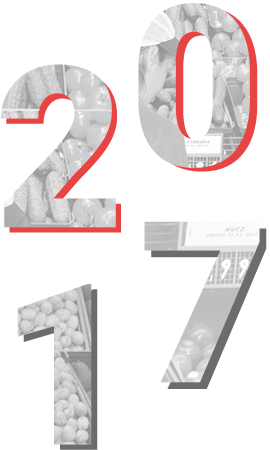 During 2017, 476,833 hours of training were given to more than 34,022 store, warehouse and headquarter employees in the four countries in which the company operates. 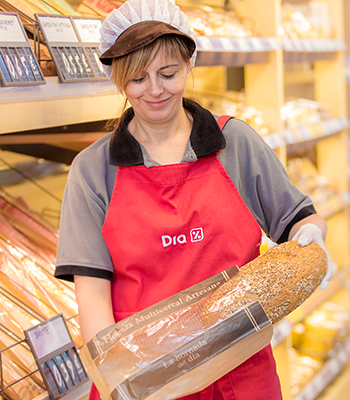 In addition to external training, the DIA Group has 31 own training centres for employees and franchisees who work in stores. These centres are involved in training sales people at all levels to carry out functions such as checkout operations, new services, and more specific tasks such as the running of the meat and fish sections. The company also runs specific training programmes in its logistics centres, mainly focused on the efficient use of tools and machinery, and (as for the other profiles) on guaranteeing the occupational safety of its workers. In addition to the focus on digital transformation training in Spain, in Argentina the “Escuela de Excelencia operativa DIA” (“DIA School of Operational Excellence”), is involved in training employees in daily operations in the regional centres. During 2017, close to 700 employees were trained at this school, taking part in more than 800 specialised courses. In Brazil, progress has been made in developing initiatives within the framework of the “Universidad DIA” (“DIA University”) project. This is a strategic pillar for the training of employees in Brazil, offering ongoing training to transform their skills and knowledge into business results. Portugal continued to provide training on skills related to the new services implemented in its stores, focusing on aspects such as the management and handling of fresh produce, new applications, and digitalisation. During 2017, more than 6,000 store and warehouse employees participated in these training courses with the aim of ensuring that they have the correct knowledge in relation to the new proximity and attraction formats. DIA has tools to identify and recognise the value that different functions generate for the organisation. This more flexible system, in addition to offering organisation coherence, allows the company to recognise the strategic business areas and identify the employees who add value to the company, based on the parameters of system with common criteria. Year after year, the DIA Group keeps a constant focus on internal promotion and long-term professional development, leveraging employee profiles with a bigger global and transversal vision of the company. During 2017, 47% of vacant positions in offices were covered internally, implying a shift of 9% of the workforce.